In this lesson we discussed file hashes, including MD5 digests and SHA256. We also unwrapped the mysterious world of digital signatures including integrity, authentication and non-repudiation. We begin a new section on risk starting with its definition. Then we talk about the differences between vulnerabilities, threat actors and exploitation. 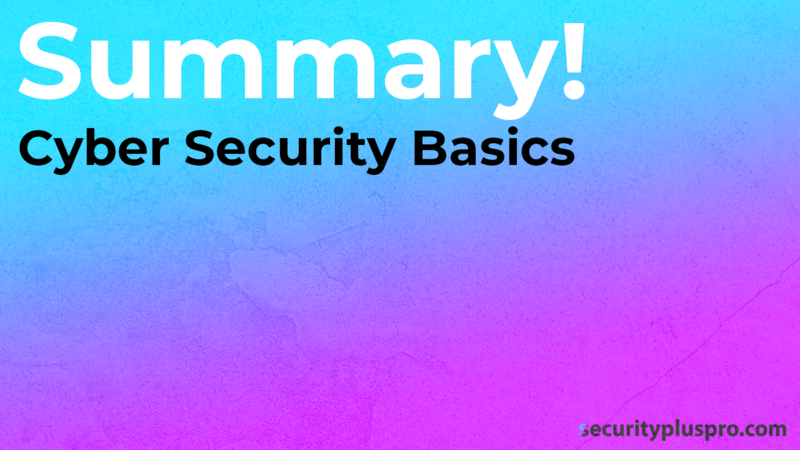 You'll also learn about evil insiders, security incidents and how to mitigate risk. We also dive into various technical controls and touch on the principle of least privilege, administrative controls and physical controls. It's jam packed so take notes! It's all about: preventive, detective, corrective, deterrent and compensating controls - all stuff you need to ace the exam! You'll learn about hardening servers, account disablement policies, change control processes, log monitoring, trend analysis and various backup controls. Let's get it baby! Yes! Virtualization Baby! It's time to get dirty with virtualization 101. You'll learn about VMs, and Type 1 and Type 2 hypervisors. We'll talk about hosts and guests and the advantages of virtualization including cost, scalability and elasticity. It's on like donkey kong! Let's go. Pop question: do you know what Application Cells are and how they differ from VMs? And you know what VM sprawl is right? You better know these things if you want to pass the CompTIA Security+ exam! Read up so you can be prepared - don't worry I've got your back man. Yo! It's time to build our hacking lab so we can get hands-on experience studying. You can't pass the exam with concepts - you need a real lab so you can test things and really see how cybersecurity works. Let me coach you in this seven part series. In this lecture, you'll learn how to download VMWare workstation and install it. There are tons of screenshots and even a hands on video. Does it get any better than this! Aww yeah! Today you're going to learn how to download Kali Linux (the most awesome penetration testing and ethical hacking toolkit ever) and use Windows PowerShell to verify your version of Kali hasn't been hacked. As always you're getting tons of screenshots and a video walkthrough. Let's go! This is a beefy tutorial. I'm going to walk you through, step-by-step, from start to finish, how to install Kali Linux from scratch. It's a long one but it's got everything you need in one nice little tiny post. Now it's time to pimp out the interface. You can't call yourself an ethical hacker and use the default settings man! You're actually going to learn four awesome tricks in this lesson: (1) How to change the Kali screen resolution to full HD (sounds simple but it kinda isn't). (2) How to make that resolution change permanent. (3) How to change the time format in Kali (4) how to setup a global theme and (4) how to update and upgrade all the Kali Linux packages. As always, this lecture is jam packed with screenshots and video walkthroughs. Let's not waste any more time! Check it out now. We will download and install Windows 10 and then I'll show you how to setup your VMWare Network Adapter. Screenshots and video walkthroughs abound. VMWare tools makes your life in VM land easy but installing this thing in Linux has always been frustrating - until now! In this lesson, I'll show you the wrong (but often used) way to install VMWare tools and then you'll learn the future proof, recommended, method of installing VMWare tools. We're going to dive in and have a play in the Linux terminal. It's going to be awesome. Alright - so let me show you the low down on sharing folders in Kali - this is extremely useful because you'll be able to transfer files from your Windows physical machine to your Linux virtual machine. It's just another way to get files in and out of your VM. In this lesson you'll learn two tricks - one using cifs-utils and the other using shared folders. It's time to up your command kung fu bro. In this lecture, we've got step-by-step screenshots and video walk explanations of how to do the following: (1) opening the command prompt, (2) using PING like a pro, (3) the purpose of ARP. And then at the end we'll log into a Cisco router and inspect some raw packets - consider that the cherry on top! ipconfig, ipconfig /all, ipconfig /displaydns, ipconfig /flushdns, netstat -anob, tracert, pathping! What! What! What! These are all the command you need to dominate the command prompt and pass the CompTIA Security+ exam! Are you ready for this!? And the best part? I've got step-by-step video explanations and screenshots for ya! 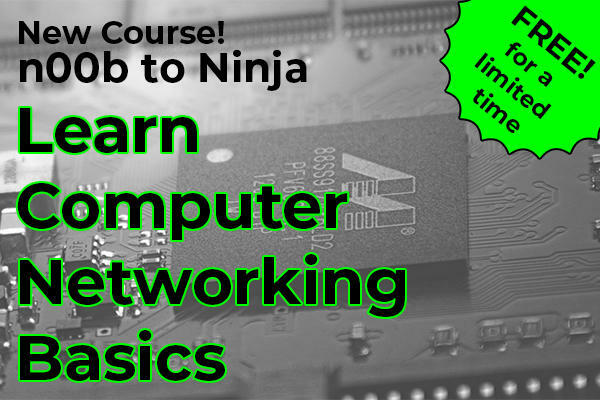 Oh man this is the tutorial mini-series I wish I had when I passed the CompTIA Security+ exam! I've got an in depth introduction to the Linux terminal! You'll learn (1) how to launch the Linux terminal in Kali and (2) how to navigate the terminal. Then you'll learn about the Linux commands every cybersecurity professional and penetration tester needs to know: pwd and the --help flag. Then to top it all off, we'll play with hte macchanger command and I'll show you how you can use Linux to train you how to learn Linux! Amazing! Yes! Yes! Yes! Today we're going to dive into ping, ipconfig vs ip, netstat, tracert and arp from the Linux terminal. This is a good time to invite your girlfriend over to shoulder surf because you're going to look like a freggin hacker. (just make sure you have "DeadMau5 - Not Exactly" playing the background when you do). If you like what you see I strongly suggest you sign-up for our newsletter and check our our online courses which will push you forward in your career. Peace!